The ultimate tower of individual cakes. 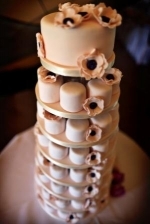 Towering several feet high over 8 tiers, 100 individual chocolate and lemon sponges, each with a layer of buttercream, iced in a delicate shade of soft pink and decorated with matching hand made sugar flowers. 6″ top tier to match. Our thanks to Neale James for this photograph.